If you held off on purchasing a DROID RAZR MAXX HD on opening day (that would be yesterday), then you are today’s winner. Amazon has already dropped their price for the device to $199 (from $299). So, you can get the whoppin’ 3300mAh battery and extra internal storage for the same price that you would pay for the regular RAZR HD at Verizon. 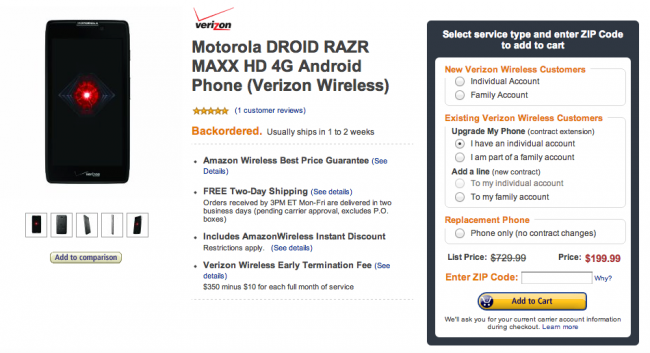 If $199 still seems steep and you are fine with the regular RAZR HD, then you are in for a treat here as well from Amazon, who is selling both the black and white versions for $149. Oh, and in case you were wondering, these prices stand for both upgrades and new customers. Yep, everyone is covered.